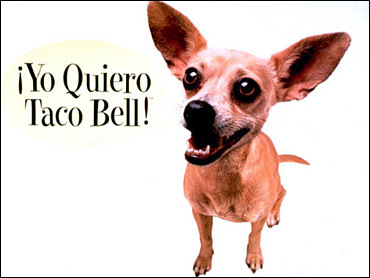 Taco Bell’s chihuahua Gidget, the one made famous by the Yo Quiero Taco Bell commercials, has died at the age of 15. Farewell, Gidget. You introduced the chalupa and the gordita to me, and promoted that 90’s Godzilla movie that I wound up seeing. I will never forget you. I’ll be pouring a little baja blast Mountain Dew on the curb in your memory. Previous Post Febreze likes to keep things fresh. And by fresh, I mean dishonest. Next Post Katy Perry sluts it up on the Today Show. AGAIN.